Leading Manufacturer of acid dyes, leather acid dyes and wool acid dyes from Ahmedabad. In order to retain our goodwill in this industry, we are providing an array of Acid Dyes. Our clients can obtain from us a wide range of Leather Acid Dyes. These acid dyes comprises of dyes belonging to AZO, 1:1 metal complex, 1:2 metal complex and 1:2 metal complex dyes with soluble groups. These dyes are applied to wool with addition of acid or acid salts. Besides wool, these are applied to polyamide, silk, leather and to some extent on paper too. These dyes use different dyeing methods depending on the class. Owing to the properties like good fastness, these dyes are highly appreciated by our clients. We provide a broad class of Wool Acid Dyes. These dyes stand unbeatable in the international market. We manufacture Wool Acid Dyes of excellent quality using harmless chemicals for our clients. Due to its high purity our product is in huge demand. An acid such as vinegar, acetic or sulphuric acid is used with acid dye to set the colour. 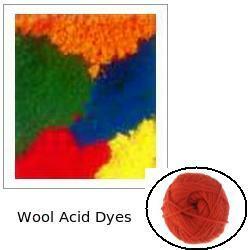 Acid or acid salts are used in combination with Wool Acid Dyes when applied to wool. Product Name C.I . No.